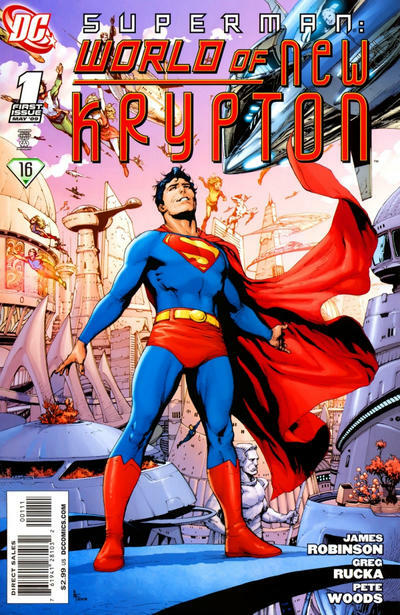 Episode #128: The World Of New Krypton: The Review! Superman: World Of New Krypton 1! Since WAR OF THE SUPERMEN #4 (of 4) is published this week, this episode I will share my thoughts about the whole NEW KRYPTON storyline, which has involved the Superman family of titles for a little over a year. I give a brief review of some of the plot lines, my likes and dislikes about the whole storyline, and the collected editions available and forthcoming for this story. Check the DC Comics website or the Collected Comics Library podcast and blog at: http://collectedcomicslibrary.com. Also, check out Kaman Stowell's Superman video podcast at his website: http://kamanspodcast.webs.com/ or on youtube at http://www.youtube.com/user/stowekam . Next Episode: GEORGE PEREZ ON SUPERMAN COMICS! Episode #127: Happy Birthday, Win Mortimer! (L to R:) Action Comics 101 Oct. 1946, Superman 51 March/April 1948 & Adventure Comics 373 October 1968! CRIME PARADISE, in ACTION COMICS 101, October 1946, published around August 15, 1946. THE MAGNETIC MOBSTER, in SUPERMAN 51, March/April 1948, published around January 7, 1948. It was written by Alvin Schwartz and both pencilled and inked by Win Mortimer, who often inked his own work. THE TORNADO TWINS, in ADVENTURE COMICS 373, October 1968, published around August 29, 1968. This story was written by Jim Shooter. It was reprinted in LEGION OF SUPER-HEROES ARCHIVE vol. VIII. Next Episode: SUPERMAN: THE WORLD OF NEW KRYPTON: THE REVIEW! 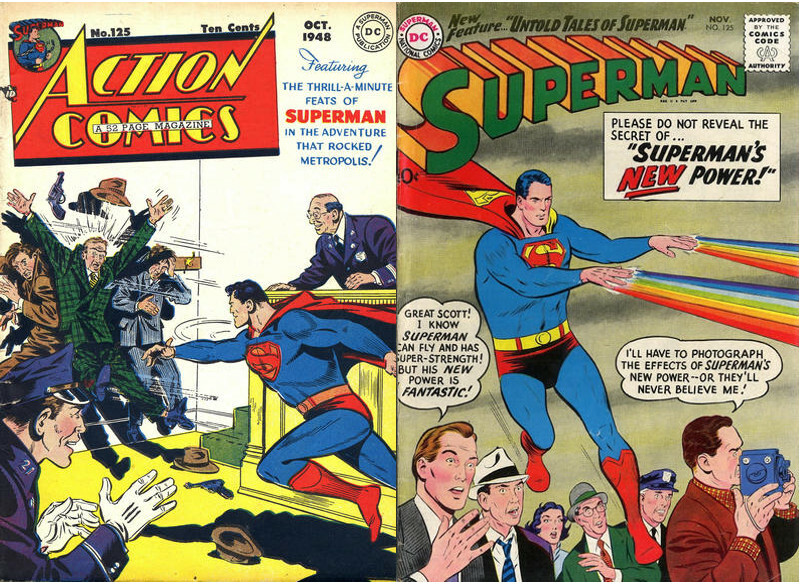 Episode #126: ACTION COMICS #125 & SUPERMAN #125! 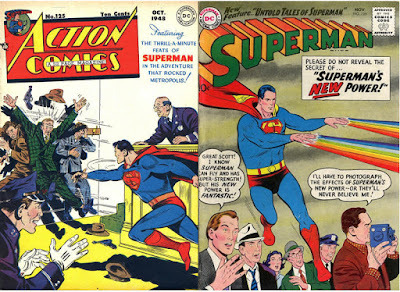 Action Comics 125 (Oct. 1948) & Superman 125 (Nov. 1958)! 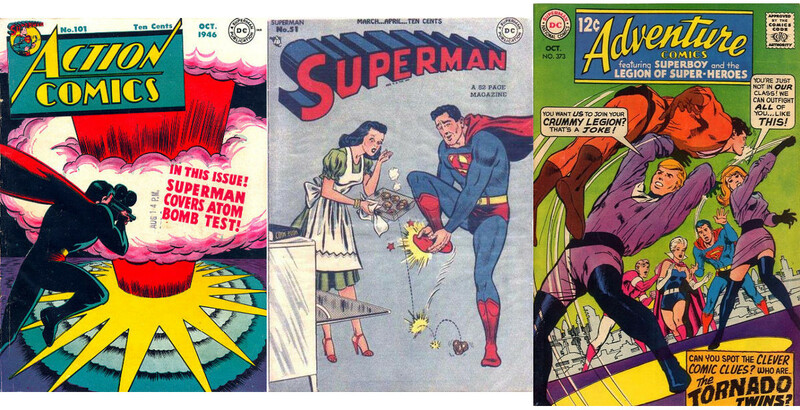 This episode continues our quarterly look at every 25th issues of ACTION COMICS and SUPERMAN. Mort Weisinger was the editor for both issues. Superman: THE MODERN NOSTRADAMUS, drawn by Al Plastino. Congo Bill: MAN AGAINST MANHUNTER, drawn by Edwin J. Smalle, Jr.
Zatara: THE PHONY PITCHMAN, drawn by William F. White. Vigilante: THE RELUCTANT ANNIE OAKLEY, pencilled by Jerry Robinson and inked by Mort Meskin. SUPERMAN #125, November 1958, published around September 18, 1958 (two years before I was born). It contained 32 pages and also sold for a dime. It contained three stories, all of which were reprinted in SUPERMAN: THE MAN OF STEEL ARCHIVES vol. I & SHOWCASE PRESENTS: SUPERMAN vol. I.
LOIS LANE'S SUPER DREAM was written by Jerry Coleman and drawn by Kurt Schaffenberger. This story was also part of EPISODE #83: LOIS LANE'S SUPER DREAMS! CLARK KENT'S COLLEGE DREAM was written by Jerry Coleman and Al Plastino. Along with the reprint editions mentioned earlier, this story was also reprinted in THE GREATEST SUPERMAN STORIES EVER TOLD (1987). SUPERMAN'S NEW POWER was also written by Jerry Coleman, pencilled by Wayne Boring and inked by Stan Kaye. Next Episode: HAPPY BIRTHDAY, WIN MORTIMER! Episode #125: Happy Birthday, Dennis O'Neil & Free Comic Book Day 2010! Dennis O'Neil was born on May 3, 1939 in St. Louis, Missouri. He had a long career and prolific career as a comic book writer and editor. His most famous work was with artist Neal Adams on GREEN LANTERN / GREEN ARROW and the Batman titles, and Denys Cowan on THE QUESTION. He also had a short but famous run on Superman in the early 1970's under editor Julius Schwartz. Dennis wrote stories for SUPERMAN issues 233 - 254, cover dated January 1971 - July 1972. You can read this storyline in the hardcover SUPERMAN: KRYPTONITE NEVERMORE. NEXT EPISODE: ACTION COMICS 125 & SUPERMAN 125!